Arthritis and the Weather: Is There a Connection? « Excessive Heat – Danger! There is no shortage of old wives’ tales about health and weather. And while there are real connections between certain illnesses and environmental conditions, there’s an equal number that are pure fantasy. Perhaps the one connection that gets the most attention and questions concerns arthritis and weather – does weather, in fact, cause arthritis pain? The simple answer is “yes.” It’s not your imagination. Here’s what research reveals about the connection between weather and arthritis pain. Changes in temperature or barometric pressure (a scientific method for measuring the weight of the surrounding air) trigger joint pain, though researchers aren’t entirely sure why. In 2007, Tufts University researchers in Boston reported that every 10-degree drop in temperature corresponded to an incremental increase in arthritis pain. Increasing barometric pressure was also a pain trigger in the Tufts study. Cadaver studies have determined that barometric pressure affects pressure inside the joints. In one experiment, when pressure in the hip joints was equalized with atmospheric pressure, it threw the ball of the hip joint about one-third of an inch off track. While there are different theories about why weather would affect arthritic conditions—the most common theory does concern barometric pressure. Some medical professionals say that an inflamed joint is subject to swelling and if the barometric pressure is decreased, that would allow the inflamed tissue to swell more, simply because there is less atmospheric pressure holding the tissue back. If there are nerves in that tissue, then those nerves would be stimulated by that swelling and that would translate into pain. Cold weather is another mechanism that could translate into arthritic symptoms, according to researchers. In the same way that a decrease in barometric pressure decreases swelling of an inflamed joint, cold weather would have the opposite effect. If cold temperatures shrink tissue down, it pulls on nerves, causing pain. Although there is still not a specific mechanism that definitively proves how weather affects arthritis, some researchers maintain that cold weather tends to create lifestyle conditions that can lead to arthritic symptoms. Some rheumatic conditions become worse with a sedentary lifestyle—a condition that is more prevalent in the winter months. During winter, many people lead a less active lifestyle and their joints tend to stiffen up. This is commonly referred to as gelling, where joints become “gelled’ because an individual might be sitting in one position too long and it causes pain and stiffness. 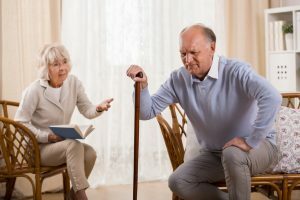 So the next time your elderly aunt or uncle says they can predict rain simply by the pain of an arthritic knee, there really may be some truth to that. This entry was posted in Caregivers, Tips and tagged arthritis, joint inflammation, weather. Bookmark the permalink. Comments are closed, but you can leave a trackback: Trackback URL.